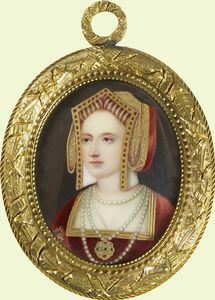 Portrait of a lady called Katherine Parr (1512-48); 1844. Enamel, 4.8 × 3.9 cm. Purchased by Queen Victoria from the artist in 1844. Signed, dated and inscribed on the counter-enamel: Katharine Parr / London Febr 1844 / Painted by Henry Pier. / Bone Enamel Painter / to Her Majesty & H.R.H. / Prince Albert &c. From / the Original in / Lambeth Palace.